Welcome to the Bacon Arms. Our historic inn offers homely atmosphere. Book our fantastic buffets for your next party! 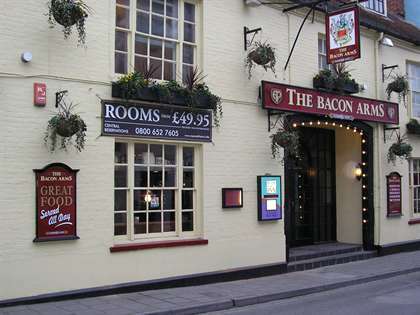 The Bacon Arms in Newbury is a 17th Century Inn with an intriguing history dating back to the Civil War. A homely atmosphere and a wealth of character await your visit, with many original classic English features and 13 refurbished en-suite bedrooms gracefully combining the old and the new. The inn is conveniently located in the heart of the ancient town of Newbury on the A34 between Oxford and Southampton, near Newbury Race Course and a number of other historical landmarks including Highclere Castle, Donnington Castle or the famous Corn Exchange Theatre. Pub food is served all day with a choice of a main or snack menu. Hotel accommodation prices include our fantastic free breakfast. Sign up for A FREE drink on us! We’ll keep you updated with great offers, and news of what’s happening here at the Bacon Arms. Sorry there's an issue submitting the form. We’re sorry to have to ask but by law we have to so that we can send you our offers. Please tick to confirm that by registering, you are giving your explicit permission for us to use your name and email address to send you offers and details of events. We will not send you any unrelated marketing information or pass details onto Third Parties.